A small population of rattlesnakes that already is in decline in southern Illinois faces a new and unexpected threat in the form of a fungus rarely seen in the wild, researchers report. The eastern massasauga rattlesnake (Sistrurus catenatus catenatus), a candidate for protection under the federal Endangered Species Act, suffers from habitat loss and environmental stresses wherever it is found, said University of Illinois comparative biosciences visiting instructor and wildlife veterinarian Matthew Allender, who led the health investigation. Long-term population studies of the snake – in Illinois and elsewhere – had never turned up evidence of debilitating fungal infections. But in 2008, biologists studying the snake reported to Allender that they had found three sick snakes in a park in southern Illinois, all with disfiguring lesions on their heads. The snakes died within three weeks of their discovery. A fourth snake with a similar syndrome was discovered in the same park in the spring of 2010. Chrysosporium also is emerging as a dangerous infection in humans with weakened immune systems, he said. 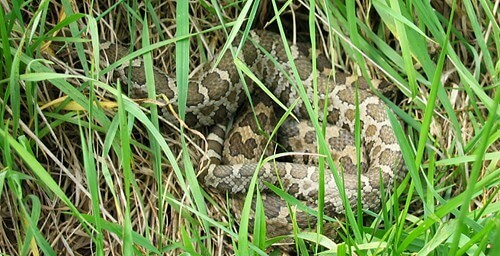 Shortly after he first presented his findings at a meeting of the Fish and Wildlife Service, Allender heard from other biologists about similar infections in snakes in the northeast United States. “They seem to be having a similar problem in timber rattlesnakes in New Hampshire and Massachusetts,” Allender said. Although biologists have sporadically identified Chrysosporium in those snakes, the symptoms they report – facial swelling and ulcers and malformations of the jaw – are the same, he said. These infections also occurred only within the last five years. Allender sees this new occurrence of a fungal infection in endangered snakes as a “yellow flag” that warrants more study. Previous articleCan Consuming Caffeine While Breastfeeding Harm Your Baby? It is really sad to see that rattlesnakes are facing such problem in Southern Illinois where they are already in small numbers but I guess this is what we call nature. As many snakes are a danger for many species so in this case they seems to be on the receiving end. Here I would also like to share a website (rattlesnakes.us) where you can find all the facts and information you want about rattlesnakes.